Just days after Peyton Ramsey earned the starting spot at quarterback for Indiana, one of his competitors for the position has decided to leave the program. Brandon Dawkins, a former Arizona quarterback who transferred to Indiana in April, told coach Tom Allen he was "going in a different direction and wanted to sort things out," Allen said Monday. "We wish Dawkins nothing but the very best, fine young man," Allen added. Dawkins was the Wildcats' starting quarterback for the first five games of 2017, but the dynamic Khalil Tate supplanted him in a game against Colorado and Dawkins never got the job back. 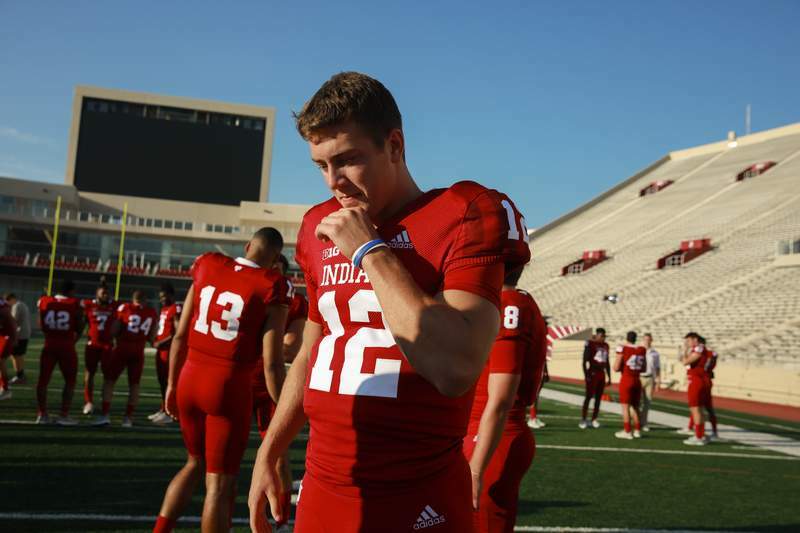 He was a graduate transfer when he left for Indiana, making him immediately eligible and leading many to speculate he'd be the starter when the Hoosiers opened 2018. Dawkins accounted for 13 total touchdowns and completed 61.4 percent of his passes for Arizona last season. The transfer spent the summer and fall in a battle with Ramsey, who started for part of last season, and true freshman Michael Penix Jr. Allen announced Friday that Ramsey would be the Week 1 starter against Florida International. With Dawkins' departure, the Hoosiers are down to two scholarship quarterbacks in Ramsey and Penix, only one of whom has seen any college snaps. To add depth to the position, Allen said true freshman Reese Taylor would begin getting reps at quarterback. Taylor, a three-star athlete who starred at Ben Davis High School in Indianapolis, was the 2017 Indiana Mr. Football. He accounted for 54 touchdowns as a senior in high school (40 passing and 14 rushing), but had been splitting time between wide receiver and defensive back with the Hoosiers. Allen said Taylor could still see some snaps at those positions even though he'll practice with the quarterbacks.